Blockchain Economic Forum 2018 is a three-day high-end event with 1000+ attendees, 100 top-notch speakers, and well-prepared agenda aims to drive the discussion on the blockchain expansion, innovations, and integration with our existing economy. Join BEF to meet the most prominent names in the field of the blockchain, gain wisdom and insights from premier leaders in the industry, learn valuable new skills, increase awareness of new blockchain projects and network with other crypto professionals. In February 2018, Seamless Thailand will bring together key experts, innovators and entrepreneurs to dive deep into the essential trends transforming the payments, retail and e-commerce industries across Thailand. Seamless Thailand will be 2 days packed with the latest content on topics such as digital payments, the Thai National payments ecosystem, omni-channel retailing, financial inclusion, blockchain, e-commerce, transfer and remittances, social and mobile commerce, fulfilment and much more. 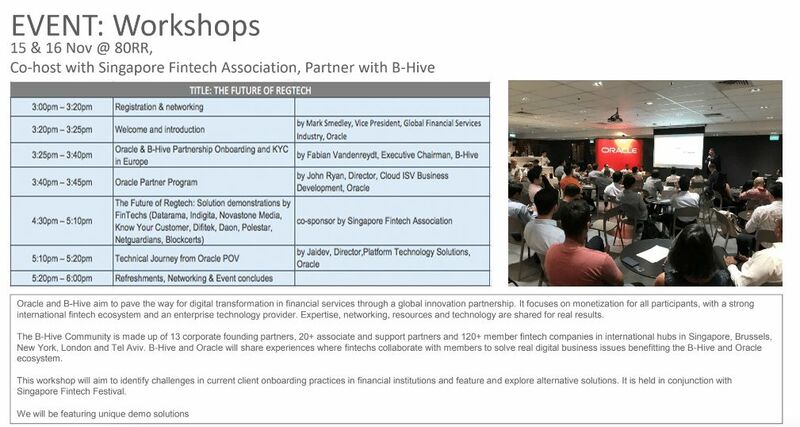 Over 60 financial, retail and e-commerce thought leaders from global institutions like Facebook, Big C, Siam Commercial Bank, IndoSuisse, The Bank of Thailand, Ascend Group, Pomelo, Krungsri Bank, Eatigo, Priceza, TMB Bank, Go Tasty, Chilindo, Kinkao, FitCraze, Central Group, the ETDA, Thai Fintech Association, the National Innovation Agency and more will be taking the stage to exchange ideas and share best practices. MoneyLIVE: Indonesia 2018 will bring together senior representatives including key decision makers from banks, start-ups, FinTechs and regulators to provide a strategic overview of the Indonesian banking landscape. This conference will look at the transformation of banking being driven by adoption of digital technology and platforms, the rise of start-ups and FinTechs, the growing market for modern banking services, and the desire for improved financial inclusion. Register now and get 15% off with code "fintechnews"
Insurance Innovators: Indonesia is Marketforce’s second annual conference in Jakarta, and is the premium insurance event in Indonesia. The conference plays host to high level representatives from incumbent players, start-ups & InsurTechs, and central institutions from the local and regional level. Anti-money laundering (AML) and financial crime threats are increasing at an alarming speed. With financial crime trends and typologies evolving rapidly, Asia’s financial institutions must work smarter in deploying innovative technologies and sound controls to ensure compliance whilst driving effective public-private-partnerships. Part of the 2018 Financial Governance, Risk & Compliance Week, join us at the 5th Annual AML & Financial Crime Asia Summit as we gather Asia’s leading AML and financial crime experts to share the latest financial crime threats in Asia and how effective mitigation strategies – offering insights on automating AML investigation, transaction monitoring, developing end-to-end customer on-boarding process, cyber risk and more! As regulators increase their scrutiny over the conduct of financial institutions in the region, compliance and risk officers now play a critical role in safeguarding the integrity of their organisation. Coupled with an increasingly digitised operating environment, there is an even greater pressure for compliance and risk leaders to ensure the effectiveness and agility of their existing risk and compliance programs against new and unknown threats..
Part of the 2018 Financial Governance, Risk & Compliance Week, the Financial Compliance & Operational Risk Summit will cover topics ranging from enhancing cross border compliance, managing cyber threats, conduct risk and more! The Big Data & Analytics Innovation Summit is Asia's preeminent cross-industry event where senior data and analytics leaders get together, to discuss the latest big data trends and innovations, how organisations of all sizes embrace big data to achieve sustainable, profitable growth. 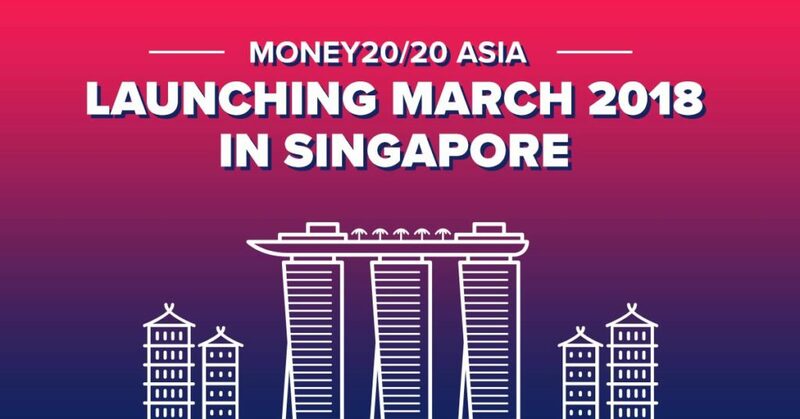 We are excited to announce that we have partnered with Money20/20, the world’s largest payments and financial services innovation event, as it launches its Asia edition this coming March, at the Marina Bay Sands in Singapore. The event is shaping up to be ground-breaking, with an agenda covering FinTech’s hottest topics over 3 days of intense networking, learning and business – it’s destined to be the place where APAC’s leading innovators come together to shape the future of money. Don’t miss out - tickets are selling fast and we’ve got an exclusive discount code for you. Save over 25% on your all-inclusive ticket with code: 18FNS if you book before Friday, January 19th. Over the next five years, robotic process automation will drastically transform the modern workplace. Businesses in the Philippines have already been impacted by RPA, resulting in increased pressure to retain competitive edge and sustain growth. Following the SOLD OUT RPA Asia Summit that took Singapore by storm, we are proud to bring you the RPA Philippines Summit for the first time! It’s an unrivalled opportunity to gain step-by-step guide to kick start your RPA initiative, benchmark with peers to ensure you get your deployment right first time, and effectively augment human workforce capabilities to drive secure, compliant and value-adding change across both front and back offices. 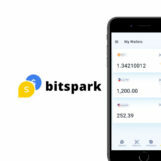 We all know that Blockchain is about eliminating redundancy by cutting out the 3rd party; and in an increasingly digital environment, the identity and purpose of the bank is becoming increasingly scrutinized. By leveraging on Blockchain technology, banks are future-proofing themselves and securing their position as not the obsolete 3rd party but the permanent player in financial transactions. However, while there is a lot of theory about the benefits of Blockchain, there is little discussion on the practical applications that banks need to know in order to implement this into existing processes and transactions. As data volumes and sources of data grow at an unprecedented rate, businesses are operating in an Age of Data. Many businesses are leveraging on machine learning to unlock the value of data and improve organization growth as well as customer experience. However, the question is, how do you implement it correctly? Join leading players across industries as they showcase how they harness machine learning to improve customer engagement, product and services offerings as well as operational efficiency. LendItFintech USA 2018 returns to San Francisco as we host World’s Leading Event in Financial Services Innovation at the Moscone Center. The year’s event brings together 5,000 decision makers from major fintech, blockchain, digital banking and lending companies for 3 action-packed days of networking, learning and doing business. New for 2018 is BlockFin Summit which is a unique experience for all who see the future of Financial Services inextricably linked to Blockchain.Co-located at LendIt Fintech, Blockies to participate in 1:1 investor meetings, a demo stage for crypto funds & ICOs and 40+ hours of cutting edge blockchain content. PitchIt @ LendItFintech 2018 is the world’s largest stage for startups to showcase innovation in financial services. We runs three competitions per year in the US, UK and China to identify the world’s top fintech startups. 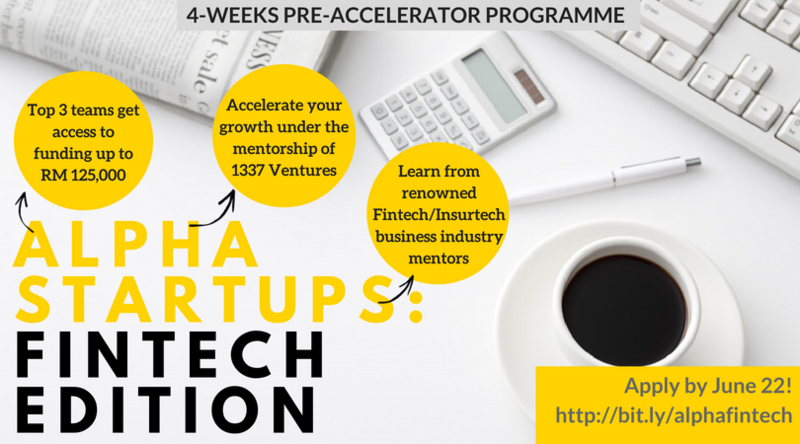 Startups from the global fintech industry can apply to perform a 7 min pitch of their product, followed by Q&A from high profile VC judges on the industry’s largest stage. This is an unparalleled opportunity to showcase their product and brand to an audience of the most powerful investors, banks, platforms and over 100 media outlets per event. Having run for over 20 years, the Seamless 2017 show gathered 6,000 participants, 200 speakers and 150 sponsors and exhibitors from across 40 countries. This year’s programme will feature 7 different tracks: 3 focused on Payments, 2s on eCommerce and 2 on Retail. We’re featuring the entire value chain of commerce – from the regulations that govern payments to the technology at the point of sale – to show how commerce can be conducted more seamlessly. Come meet industry leaders in E-Commerce, Payments and Retail including Amazon Pay, DBS, Alibaba, Vocalink, Bloomingdale’s and more! Click here to find out more about Seamless Asia 2018. Following on the successful inaugural event in 2017, AVCJ is bringing international investors to Ho Chi Minh for a day of high-level discussions, debates and networking on 24 May this year. The AVCJ Vietnam Forum will be THE meeting place for the leaders of the alternative investments industry in the region. From private equity funds, institutional investors to leading corporations and startups, join over 200 senior industry executives to discuss the investment opportunities in Vietnam. It is where the ecosystem gathers once a year to exchange ideas, catch up with friends and meet future business partners. The stellar speaker line-up include leading GPs, VCs and LPs lead ty Tra H. Le, Acting Chairman, Board of Directors, HOCHIMINH STOCK EXCHANGE. innovfest unbound is the anchor event of Smart Nation Innovations, a week-long series of events that showcase Asia’s most innovative developments. In 2018, we'll welcome over 12,000 entrepreneurs, brands, corporates, investors and tech start-ups from 100+ countries to meet and share new ideas, build partnerships and celebrate digital disruption. In partnership with Infocomm Media Development Authority (IMDA), innovfest unbound is organised by NUS Enterprise and unbound, and is Southeast Asia’s most exciting innovation festival. Co-Chaired by Yossi Vardi and Lily Chan, it is the place where brands connect with disruptive innovation and explore Asian opportunities. Four satellite events highlight the trends shaping the world of tech throughout 2018; convergence, futurenow and arise. Web Summit in early November. Runway to RISE is traveling to 8 cities in Asia to pick the best early-stage startup from each country. Access to workshops, pub crawls and all talks. Pitch on the BREAKTHROUGH stage. Zeepin is the one stop shop for any creative mind. 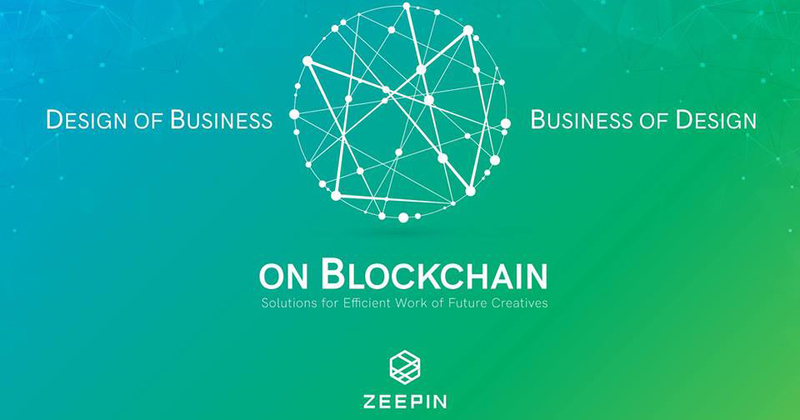 With Zeepin’s innovation and decentralized blockchain technology, it will become the most cost-effective way to bring creative ideas and products to the market. Utilizing the Zeepin token (ZPT), the Zeepin ecosystem will solve all the main issues that hold back most small organizations from expanding to the major markets. This will be achieved by several dApps that will help solve issues like copyright protection, legal aid, talent recruitment, and early phase crowdfunding project investments. What is the main theme of the meetup? Design and creativity have been used in thinking and action as well as strategies of business. How to harness the revolutionary blockchain technology to achieve business feasibility in the creative industries? 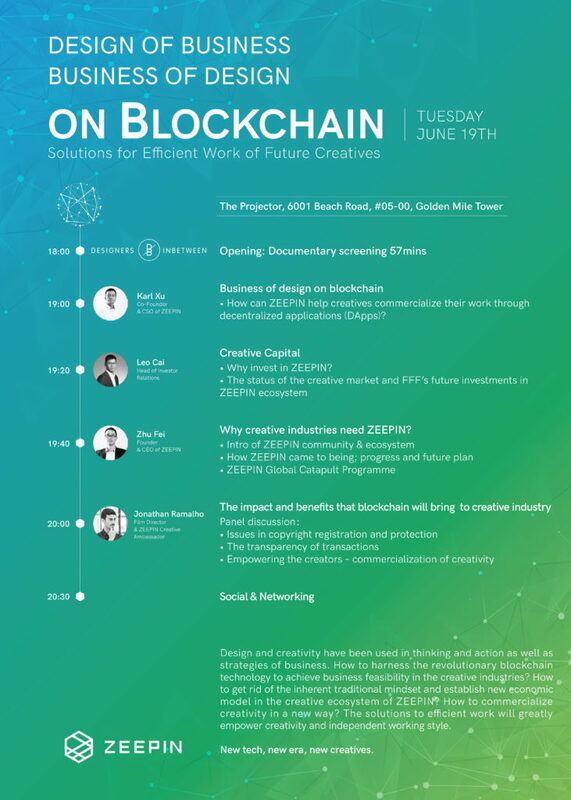 How to get rid of the inherent traditional mindset and establish new economic model in the creative ecosystem of ZEEPIN? How to commercialize creativity in a new way? The solutions to efficient work will greatly empower creativity and independent working style. The heady world of finance has been turned on its head in the decade since the global financial crisis (GFC) in 2007–8. Lehman Brothers, a leading investment bank, collapsed, its rival Bear Stearns was sold, and many others were so close to bankruptcy that only controversially generous bailout packages could save them. As familiar names from the banking world struggled, China stepped into the limelight, becoming the world’s biggest source of capital. Today four of the world’s top five banks are Chinese. Tech giants such as Apple, Amazon and Facebook have become the most valuable companies and attract the best talent. Why suit up for Goldman Sachs when you could wear flip-flops and t-shirts at Facebook? Financial technology (fintech) companies, from Ant Financial in China to Square in the United States, have broken into the consumer-banking space like a wrecking ball. What will the next ten years have in store for Asia’s financial institutions? How has the shape of the financial-services sector changed in the last decade? Can regulators and traditional companies keep pace with the evolution? How will new technologies, from artificial intelligence (AI) to blockchains, alter the financial ecosystem further? And in the shadow of the GFC’s ten-year anniversary, what have the big banks learned that could help them avoid future catastrophes? Finance Disrupted 2018 will convene regulators, banking leaders, technologists, entrepreneurs and economists to discuss the future of banking in Asia and whether the sector is prepared to identify and prevent future crises. Techsauce Global Summit is one of the biggest Tech conferences in South East Asia with the aim of strengthening the region’s technology ecosystem as well as pushing Thailand forward to become one of Asean’s technological hubs. It is the epicentre for global leaders in technology, startups, corporations, investors and venture capitals to collaborate while networking to improve the Tech industry. 2017 was the first year we went global which saw over 5,000 attendees through our doors, with an array of multi-national tech startups, international investors, corporate initiatives and industry expert speakers. And we expect to have 10,000 attendees from more than 30 countries joining us this year. If you’re running a remote team or serious about starting one, this is the conference for you. The Running Remote Conference 2018 is carefully curated to teach you next-level, actionable strategies and tactics you can utilize the very next day to manage & grow your remote team. This is the conference we’ve been trying to find but until now it didn’t exist. MoneyLIVE: Digital Banking ASEAN 2018 will bring together over 150+ banking innovators from across the ASEAN region and beyond. With two packed full days of exclusive content hear insights on AI, open banking, digital payments, FinTech collaboration and more. From the recent step change in AI to increasing excellent customer experience, the agenda has been carefully orchestrated to allow delegates to develop their understanding of the key issues facing the industry today. With a focus on Open Banking and the integration of FinTechs with banks, the content looks to give the most current analysis on the digital banking climate. For 8 years, the AVCJ Singapore Forum has been the meeting place for the leaders of Southeast Asia’s alternative investments industry and their overseas peers. The AVCJ Singapore Forum has become a must-attend event for leading GPs and LPs, who come together to learn from each other, exchange ideas, catch up with friends and form long-standing relationships with their next business partners. Join us for an evening of learning and networking! You'll hear from experts on our FinTech growth panel, who will share tactics, campaigns and experiments that helped them grow their startups. Jose Kasijo, Brand Director @ GoBear. GoBear is Asia’s first and only metasearch engine in financial products. Piyush Varanjani, Product Marketing @ TransferWise. TransferWise is a money transfer service allowing private individuals and businesses to send money abroad without hidden charges. Rachel Dance, Head of Communications @ StashAway. StashAway is the intelligent wealth management platform that's designed to build and protect your wealth, whether that's $1,000 or $10,000,000. Jeremy Lim, Marketing @ YouTrip Singapore. HubSpot Ambassador. YouTrip is a multi-currency mobile wallet that lets you make purchases overseas, online or in-store with no hidden fees. The Crypto Finance Conference is the world’s most exclusive investor conference for cryptocurrencies and blockchain investments, with events in Switzerland, the US and soon Asia. CFC is connecting private investors, institutional investors and family offices with the leading players in the crypto and blockchain universe. The upcoming three-day conference in Half Moon Bay, California, offers expert education, investment opportunities, and excellent networking opportunities. The list of participants of each conference is strictly limited and curated by the board to enable the participating experts to build a unique network. The agenda is structured into blocks of education, investment opportunities and networking in an exclusive and private setting. Amongst the others, we're proud to host some top-notch speakers from the crypto, finance and fintech industry such as Bobby Lee (Co-Founder BTCC), Meltem Demirors (CSO of CoinShares), Wences Casares (Founder and CEO of Xapo), Dan Morehead (CEO of Pantera Capital), Jennifer Zhu Scott (Co-Founder and Principal of Radian Partners) or Brian Kelly (Author and financial market expert). The LendIt Fintech China Conference and Expo is China’s leading event for innovation in financial services empowering international companies to capitalize on China’s new financial openness policies. The event will bring together leading banks, fintech and investors from 30+ countries to learn, network and do business. Hot topics include: AI, One Belt - One Road, Fintech Innovation, Future Banking, BlockTech, and Compliance. Join the Big Data & AI Leaders Summit to experience two days of compelling data case studies, new best practices, emerging technologies and practical tips to brush up on your technical skills. Whether your goal is to improve ROI on data projects, solve business problems with AI implementations, use data to improve workplace productivity, or enhance career skills, this year's agenda will help you succeed. tickets. Early Bird offer ends mid-night, July 27. The Singapore Week of Innovation & Technology (SWITCH) is a leading “plug and play” platform where complementing international events in tech, innovation and lifestyle operate side by side in an extraordinary concept week. It is here that tech ecosystems from around the world connect and interact in one place over one week. SWITCHfeatures exhibitions, conferences, workshops and activities revolving around topics such as open innovation, technology transfer, tech entrepreneurship, venture investments and talent development. With the tagline “Today’s Inventions, Tomorrow’s World”, SWITCH 2018 will introduce more deep tech tracks and showcase the intersection of tech and lifestyle. As 2018 is the ASEAN-China Year of Innovation, SWITCH will feature various China and ASEAN tracks, bridging efforts across Asia and the world. Organised by National Research Foundation Singapore (NRF) and Enterprise Singapore (ESG), SWITCH 2018 is held from 17 to 20 September. SWITCH 2018 partners include CYZone, GE Digital, ICMG, Intellectual Property Intermediary, SGInnovate, Startup Weekend Singapore, Tabula Rasa, TechNode, TechXLR8, Women in Tech, and World Restorative Innovation Forum. Visit www.switchsg.org for more information. F10 is offering you a unique opportunity to attend the first F10 FinTech Hackathon in Asia. 48-hours of ideation and programming are waiting. In the heart of Singapore, you can meet like-minded, passionate, and curious people to challenge each other. benchmark their customer experience (CX) strategies and find out what’s trending in the world of CX! encompassing AI-Powered CX, Customer Journeys, Customer Advocacy, Service Excellence &amp; Employee Engagement and more. Spanning 4 days with a series of high-impact discussions, CX Asia 2018 will enable you to maximise your CX ROI and embed customer-centricity as an integral part of your organisation! Register today to save 10% off the prevailing rate – just quote FinSG10. Held on 26-27 September 2018 at the SMX Convention Center Manila, Seamless Philippines 2018 highlights the future of commerce. A world-class conference and exhibition featuring over 165 FREE conference sessions, 80+ exhibitors and over 3,000 attendees. It is a large-scale exhibition showcasing the latest payments, eCommerce, and retail technologies and a free to attend conference with over seven (7) dedicated theatres covering payments, eCommerce marketing, eCommerce strategy, banking, financial inclusion, and identity. The 4th annual ‘Discover Advanced Trends in E-Commerce Expo (DATE 2018) kicks off this September 27- 29, 2018 in Exhibition Hall 1 of Taipei World Trade Center. This year’s event will focus on smart retail, cross-border e-commerce, social media marketing, mobile commerce & services, and innovation in e-commerce. This year’s event will use micro-booths for the first time, in aspiring to attract more e-commerce businesses, the organizer said. Registration begins today and applicants who complete the process before the end of April will receive 50% off the full price. Online sellers from all over the world are invited to attend this prominent event. Last year (2017), attendance at DATE saw a new-time high with over 50,000 attendees. Company attendees included Uni-President, Far Eastern International Bank, Shin Kong Mitsukoshi Group, RT-Mart, Taishin International Bank, Jih Sun Financial Holding, Cathay Century Insurance, Guangdong Cross-Border E-Commerce Association, Turkish Airlines, Singapore’s EasyParcel, the Philippines’ CMG Retail Inc., and many others, which sought business partnerships. Mainland China, Indonesia, the US, Singapore, Croatia, Hong Kong, India, Malaysia, the Philippines, Thailand, and Japan were the top nations represented on the event floor. DATE 2018 is organized by the Taiwan External Trade Development Council (TAITRA), co-organized by the Taiwan Internet and E-Commerce Association, Chinese Non-Store Retailer Association, and the Taiwan Association of Logistics Management. These associations and councils have created the ultimate platform for exchange on the topic of Business-to-Business-to-Consumer (B2B2C) in the e-commerce market. 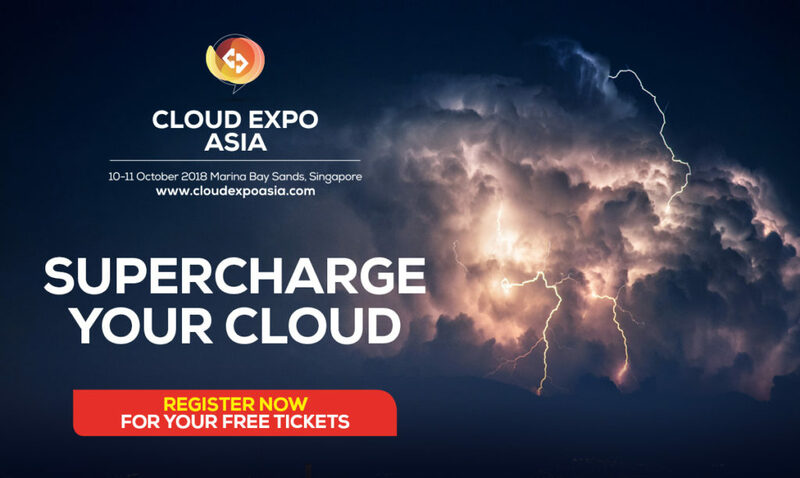 Visit the co-located event stack for FREE – Cloud & Cyber Security Expo, Big Data World,Smart IoT Singapore, Data Centre World and new launch event, eCommerce Expo Asia providing comprehensive solutions for professionals in ONE location, with ONE free ticket. health tech looks like in Asia. micro-insurance and more. 30+ Insurtech demos will be live on stage - access the network of funders who can help drive your next phase of growth. FinovateAsia is part of Hong Kong Fintech Week this year! Join us for two days of wall-to-wall fintech activity, featuring Finovate’s signature combination of fast-paced demos and insightful expertise. FinovateAsia’s demos will showcase the best new innovations in financial and banking technology from over 30 leading established companies and brand-new startups. Each hand-picked company will receive just 7 minutes on stage to provide an inside glimpse into their latest developments. Networking sessions will follow the demos each day, giving you the chance to speak directly with the innovators you see on stage, along with the rest of the awesome audience. Following the demos, Finovate will feature expert content and commentary, giving you the opportunity to delve into industry topics and trends. High-impact, short-form sessions will be hosted by more than 80 of the most accomplished bankers, brokers, investors and other tech luminaries. These sessions will be divided into specific tracks so you'll know exactly where to find the ideas most relevant to you and your company. Hong Kong FinTech Week (29 October - 2 November 2018) is the world's first cross-border FinTech event, taking place in Hong Kong, Asia's financial capital, and in Shenzhen, China's Silicon Valley. 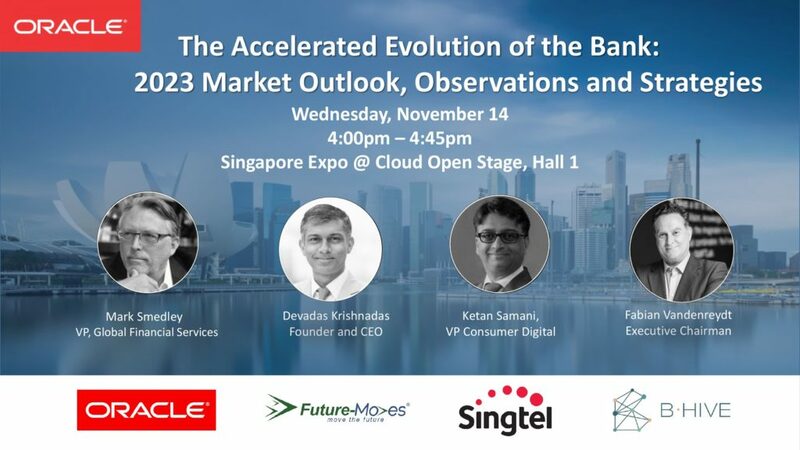 It's one of the largest conferences on the calendar, expecting to attract more than 8,000 senior executives and featuring over 200 of the world's top FinTech founders, investors, regulators, and academics, who are shaping the future of financial services by driving a technological revolution in the industry across Asia and globally. For registration, programme and speakers, please visit www.fintechweek.hk. Held on 7-8 November 2018 in Ho Chi Minh City, Seamless Vietnam 2018 highlights the future of commerce. The largest FREE conference and exhibition in Vietnam, featuring over 110 FREE conference sessions, 40+ exhibitors and over 1,500 attendees. It is a large-scale exhibition featuring the latest technologies and a free to attend conference with over four dedicated theatres covering ecommerce, banking, financial inclusion, fintech and retail. Faced with unprecedented innovation and scale, financial services companies must ask themselves what unique value they will be able to offer moving forward. 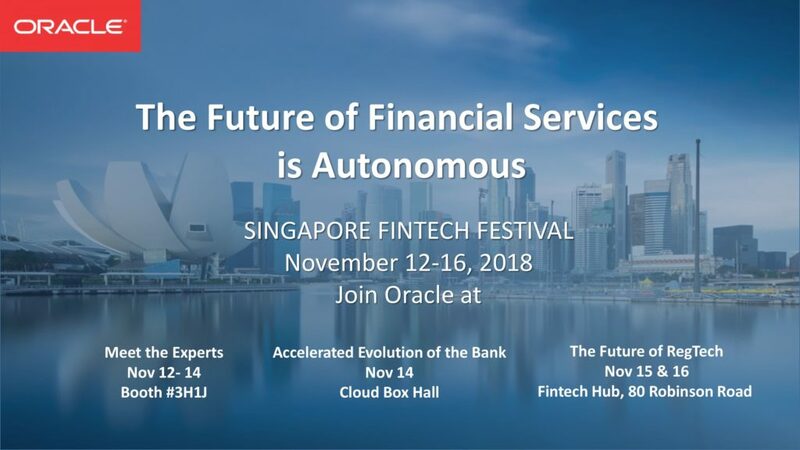 Oracle will be exploring these all important questions at the Singapore Fintech Festival 2018. They've put together several can’t-miss events that you’ll want to attend during the festival. 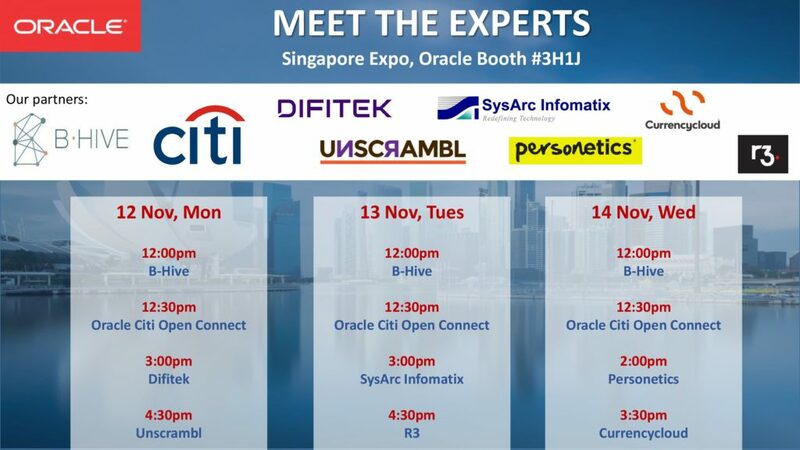 Featuring experts from incumbent banks and disruptive startups, visit Oracle’s booth at #3H1J to learn how your bank can form fintech partnerships that will address real digital challenges and create an effective way to monetise for all parties. What does the future look like? The experts will tell you (or maybe even scare you) with their prediction, market outlook and effective strategy to navigate this tumultuous new landscape. The inaugural Singapore FinTech Festival will bring together the global financial community in a week-long celebration of FinTech from 12 to 17 Nov 2018. Join the best briefing on Australia's payments/transaction developments and be a part of the top network in Oceania! Organized in collaboration with AusPayNet, the Australian Payment Summit (APS) is a strategic and pragmatic platform - developed for and by industry professionals. The payments industry is ripe with innovation and the way we pay is changing the way everyone is doing business, as well as guiding the developments of new platforms within the global digital economy. APS differentiates itself from the large, vendor-focused events and aims to fill the relationship gap where this sociable and transforming industry needs a more personable, well-networked and professional platform. More and more, regulators need to closely understand the impact of their policies and how they affect the development of this innovation in their jurisdictions. 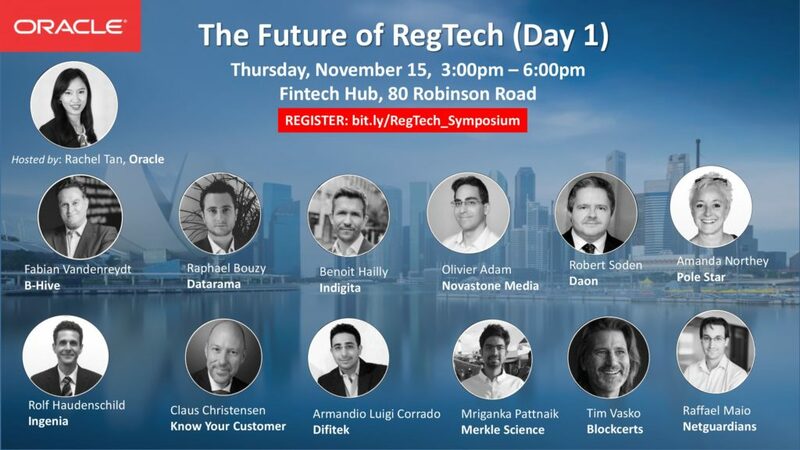 Disruptive technologies are rapidly changing the landscape and the Payment Summit series is uniquely positioned to give attendees the proper toolkit to build the optimum roadmap for the future. APS covers key trends and essential discussions on payments in the platform economy, developments in open banking, digital identity, data privacy, regulatory alignments and many other considerations within the transaction space. By sharing experiences and exchanging information on these trends including global topics such as PSD2, GDPR, and cognitive machine learning, we deep dive into issues and innovations affecting the business directions of all stakeholders and practitioners. Hype is over, progress is real: making blockchain-energy applications work across Asia right now! Join us on November 27 in Singapore at Blockchain2Energy Asia as we explore the applications of blockchain in the energy field! Blockchain Conference Philippines is an event organized by Smile-Expo – the international company which has already held 50 blockchain events in 25 countries. This year, Smile-Expo will coordinate the second Blockchain Conference Philippines, uniting top crypto experts from different countries. The Big Data & Machine Learning Leaders Summit Hong Kong 2018 is a unique 2 day event to learn from and network with 120 data leaders, AI innovators, robotics scientists, machine learning forerunners and business leaders. Seats are limited to ensure attendees get the full benefit of an intimate and interactive experience. Register now with code: FINTECH20 to save an extra 20% off on the Early Bird tickets. Early Bird offer ends mid-night, October 12.